Those who scour the obituary columns may have noticed that Wing Commander Ernest Millington DSC, the last MP who sat in the Commons during WWII has just died. It’s not only this that makes him important; he was one of the few members of the short-lived Common Wealth party to become an MP. The Common Wealth party was founded by members of the Labour party and other radicals who disapproved of the Conservative-Labour electoral truce put in place during the War. The parties three key platforms were Common Ownership, Vital Democracy and Morality in Politics (which have rather a fine contemporary resonance). Common Wealth was founded by Richard Acland, JB Priestly and Tom Winteringham. 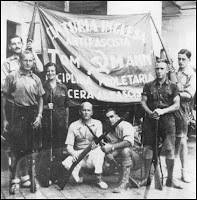 Tom Winteringham (the balding figure in the photograph)has long been a bit of a hero of mine; he commanded the British Battalion of the International Brigade in the Spanish Civil War before being wounded at Jarama. He broke with the Communist Party in 1938 and went on to take a leading role in running and training the Home Guard in Britain during World War II using techniques he’d acquired in Spain. Coincidentally, I’ve just started reading Hugh Purcell’s The Last English Revolutionary: A Biography of Tom Wintringham 1898-1949. All I need to do now is find an archaeological connection... (though Priestly was married to the archaeologist Jacquetta Hawkes).